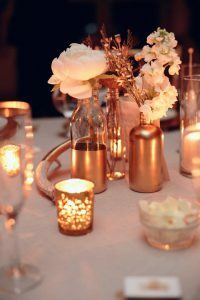 It’s not unusual for home trends to transform into wedding trends and copper is the prime example of this. 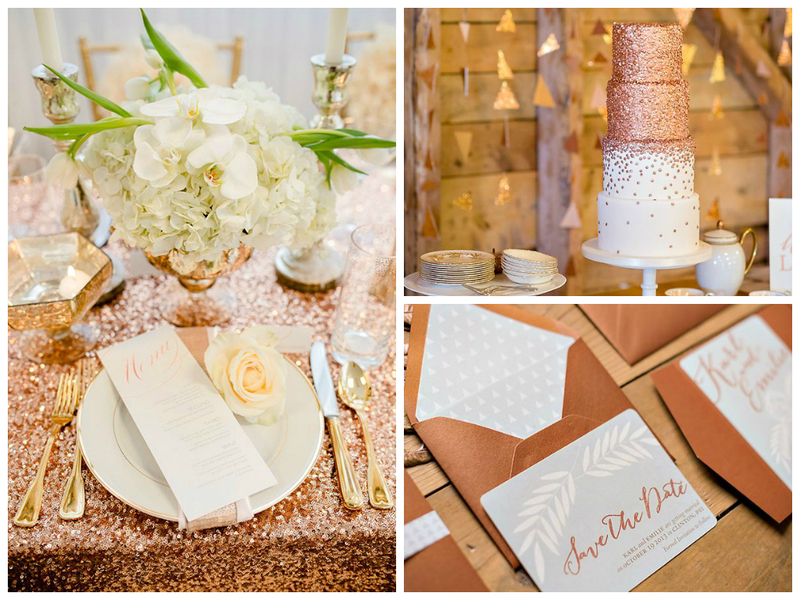 Copper designs are all over the stores at the moment and are quickly making their way into weddings. 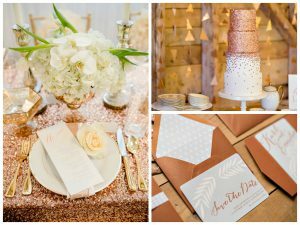 From adorning the reception tables to adding shine to the stationery and cake, copper is the new gold. Brides are ditching the traditional shades of white, ivory and cream for bold, brave shades and striking patterns. 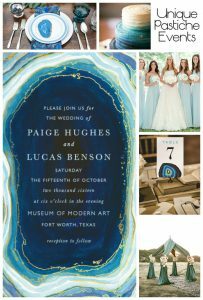 From bright and punchy gowns to pretty pastel and print dresses, color is one hot trend for bridal style in 2016. 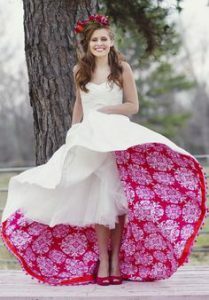 Make sure to check out all our colored wedding dress posts from shades of blue and beautiful blush to pretty print. 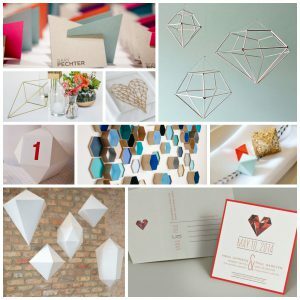 Geometric decor is in right now and that includes weddings too. 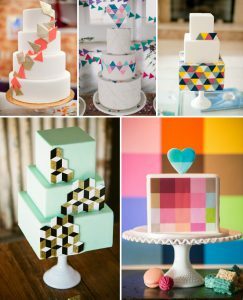 Everything from stationery and cake to wedding dresses and backdrops, geometric shapes are being used in full force. 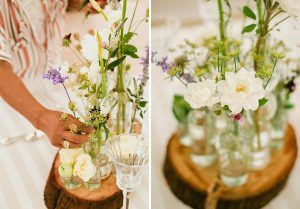 Brides and grooms are going for greenery and are turning to all-green organic botanical elements for 2016. Not only is it a visually beautiful trend it’s a great budget friendly option too. Greenery like magnolia leaf, ivy, smilax and maidenhair fern and even herbs are being bundled together and being used in place of blooms, tablescapes, signage, chair decor and hanging centerpieces are all getting this botanical treatment. It’s vintage but not as we know it. Museum style, natural history elements are going to be very popular this year. Frilly laces, jam jars and tea cups are being replaced with more antique objet style elements. 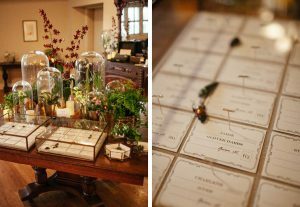 Bouquets are taking lead from historic paintings and stationery is getting a more natural museum feel with botanic and animal detailing, with foxes & deer featuring. In place of tea cups and birdcages, cloches and cabinets are being used for florals. Vintage just got a little more, well vintage! In a time where sharing everything on social media is an everyday lifestyle habit, couples are now requesting a bit of privacy on the big day. 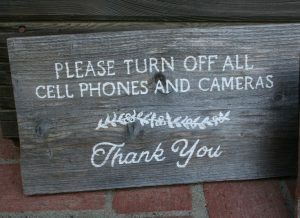 From asking their guests to refrain from taking pictures on iPads as you walk up the aisle to banning images appearing on social media throughout your day, unplugged weddings are becoming very popular. 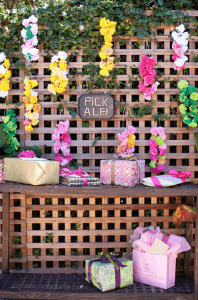 Flamingos, pineapples and palm trees are not your typical wedding decor but this year couples are going entirely tropical with their decoration. 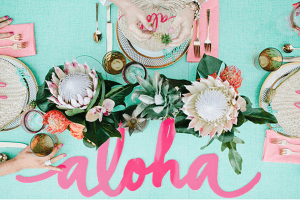 With bright bold blooms, coconuts and everything Tropicana, we fancy this fun concept for a summer 2016 wedding. 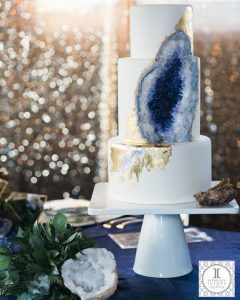 Gems seem to be all the rage right now in the wedding world, gems and rocks such as gilt agate and geodes are popping up in stylish wedding blogs across the web. 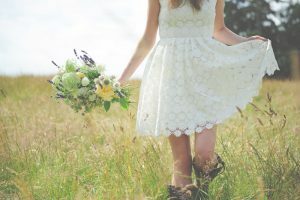 Precious stones carry certain meaning within them, and symbolize an organic connection to the earth, so it makes perfect sense to incorporate them in wedding styling. 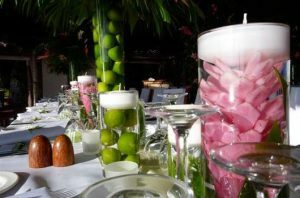 Extra efforts are being put into creating unique elements to really impress your guests. 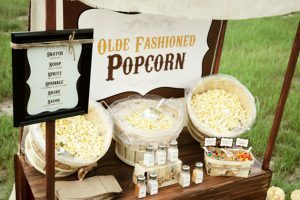 From temporary tattoo parlors, confetti bars, selfie stations and even secret cinemas to pop-up cocktail bars, food stations, delicious sweet buffets and other tasty treats such as candy floss, popcorn and pizza buffets. 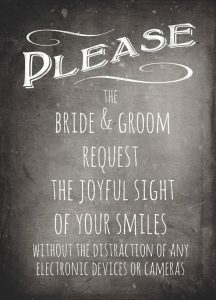 These fun interactive stations are all sure to put smiles on your guests faces. Turning tradition on its head, 2016 brides are breaking all the fashion rules when it comes to bridal style. From pairing leather jackets and floral crowns with the gown and embracing black wedding dresses to styling the leading ladies and grooms ladies in jumpsuits and separates. 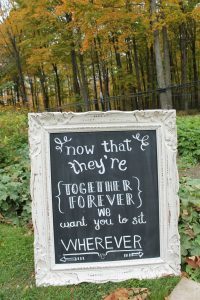 All very cool and rock and roll, this is not your typical wedding!